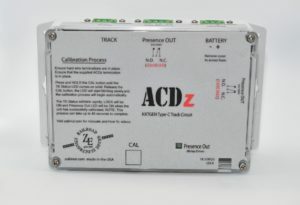 The ACDz is a new generation of the ACDC type track circuit for yard applications. Unlike its predecessor, the ACDz uses hard wire terminations in place of diode shunts and can work with insulated joints, but does not require them. The transmitter drives the track, via 2-wire connection and can be configured as an end-to-end or center fed circuit. This new approach allows the ACDz to provide the same operational logic as an ACDC circuit without the need of a railroad relay. The ACDz provides 2ea dry contact relay outputs, one for local control of a switch machine and the other for occupancy indication to the yard computer. ACDz is compatible with Z-Tools and Z-Stick. Consult Ze Engineering for alternative termination options.